With the holiday season just around the corner, it’s a great time to book Mickey’s Very Merry Christmas Party tickets! This favorite Walt Disney World® Resort holiday tradition returns to the Magic Kingdom® Park for a festive 21 nights this year. 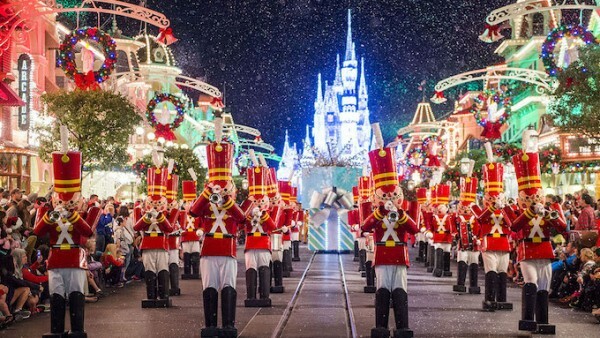 Plus, “Mickey’s Most Merriest Celebration,” will make its debut for the 2016 holiday season. In this brand new stage show with a grammatically challenged title, Mickey and his pals invite some of their friends for an unforgettable Christmas party filled with music, dancing, color and fun. You can look forward to seeing Woody and Jessie from “Toy Story,” Fantasyland friends such as Peter Pan and Snow White and many more. Presented on the Cinderella Castle Forecourt Stage, “Mickey’s Most Merriest Celebration” features special effects, magical projections and festive holiday music. And, you can sweeten your night at Mickey’s Very Merry Christmas Party with a holly-jolly premium experience. The Wishes Fireworks Holiday Dessert Premium Package gives you the chance to soak up the enchanting sight of “Mickey’s Once Upon a Christmastime Parade” from a special reserved location on Main Street, U.S.A.
After the parade, you will head to the Tomorrowland Terrace for a private dessert party where you’ll enjoy sweet treats and fantastic views of Holiday Wishes: Celebrate the Spirit of the Season fireworks. Each premium package costs $79 for adults and $47 for children ages 3-9 (tax not included). Please note a separate ticket to Mickey’s Very Merry Christmas Party is required and is not included in the price of this package. This entry was posted on October 12, 2016 at 4:08 pm and is filed under Disney News, Magic Kingdom, Special Events, Walt Disney World. You can follow any responses to this entry through the RSS 2.0 feed. You can leave a response or trackback from your own site.